I land in Singapore after the long-haul flight in from London. You can check out my review of that flight here. 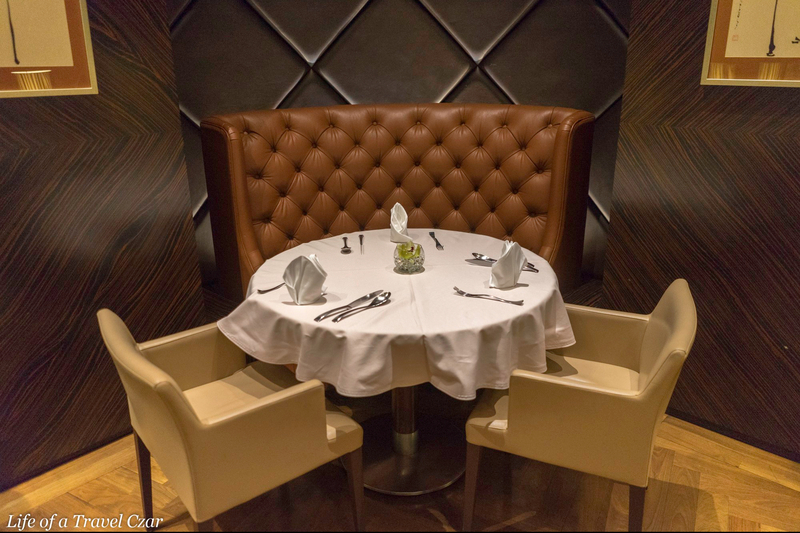 I make my way to one of the most amazing lounge’s in the world; The Private Room. This is the final leg of my trip and it’s oh so sad. I reviewed the lounge on my first leg from Singapore to London (review here). Given the transit time, I pretty much just went straight to the dining area. I start with the Satay. This dish is seasoned and grilled pieces of chicken, mutton and beef served on skewers. 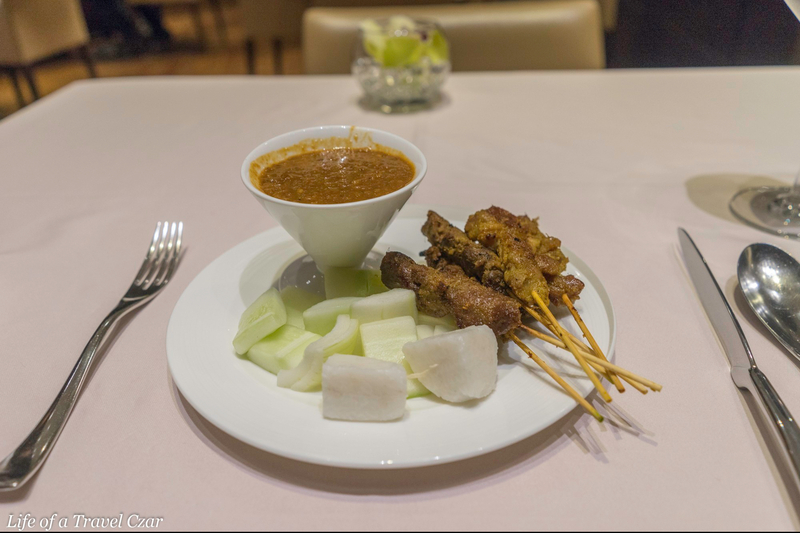 The dish is wonderful with a lovely spicy peanut sauce and blocks of cucumber and sticky rice. Some of the meats are little tough but when paired with the peanut sauce it doesn’t matter – the sauce is so delicious. 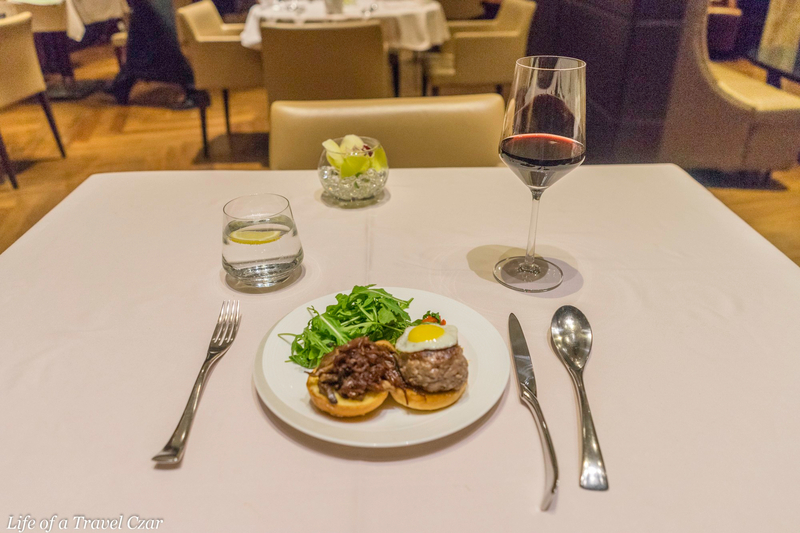 Next I have the U.S Prime Beef Burger with portobello mushroom and onion jam with a quail egg. The beef is moist and full of its natural juices, it’s quite a treat, the quail egg was a lovely touch for aesthetics plus its rich yolk went pretty nicely with the beef. The sweet smokiness of the onion jam and earthiness of the mushroom was a splendid dance partner for the beef. I didn’t quite take to the bun, but it gave me the option to skip it and avoid the carbs. A nice dish which was paired with Château Léoville Poyferré (2007) which had beautiful rich red fruits and currant flavours and some lovely velvety tannins to deal with the beef. For my final dish I have the wok-fried lobster with braised wonton noodles paired with a glass of Dom Perignon (2006). This would have to be my favourite dish in The Private Room. 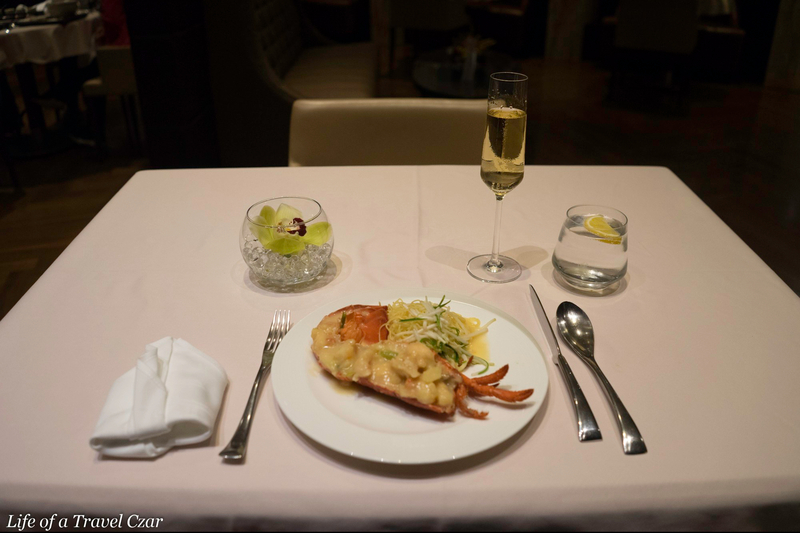 The lobster is succulent and full of its beautiful flavours with a light creme sauce. The wonton noodles prove equally dreamy and of course the vivacious acidity and citrus of the Dom Perignon cut through the dish’s richness like a sharp blade. Here is a little clip of my time in The Private Room. Eventually the boarding call chimes and I make my way out of the lounge and onto the aircraft. After take-off, it’s time for bed. It’s late and I’m so tired from my whole trip and the long haul from London. So, I have a few glass of the Dom Perignon and ask for the bed to be made as the plane jets across the Indian Ocean towards the Australian mainland. The crew make the bed, which is super comfortable with wonderful duvet and mattress. Here is a little video of the bed. The background tune is “Real Love Baby” by Father John Misty– I don’t own the rights to the song. Its a late morning arrival and I ordered through Book the Cook – I definitely recommend it for overnight flights as the menu on these flights are pretty sub-par. 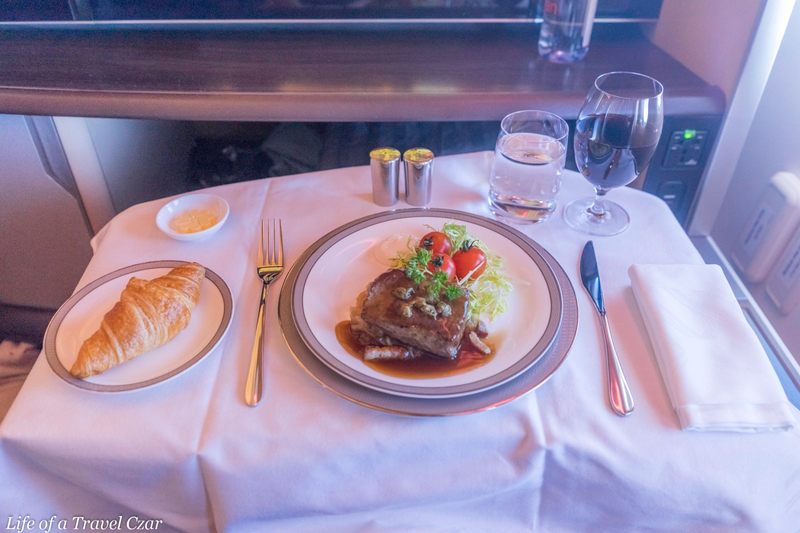 I chose the lamb loin ahead of time and overheard other passengers moaning about the lack of choice on the menu. The fruit platter is something refreshing to start with. There’s a paw paw, kiwifruit and some berries. It’s quite chilled in temperature but does give enough of a sweet kick to start the morning. The lamb loin is an interesting dish. It’s well cooked but I would have to say lacks the dazzle of the other Book the Cook dishes. It’s tender with the flavours of the jus resonating with the palate. The vegetables on the side are crisp and fresh but nothing spectacular. I wasn’t a fan of the bacon but the onions were on point. 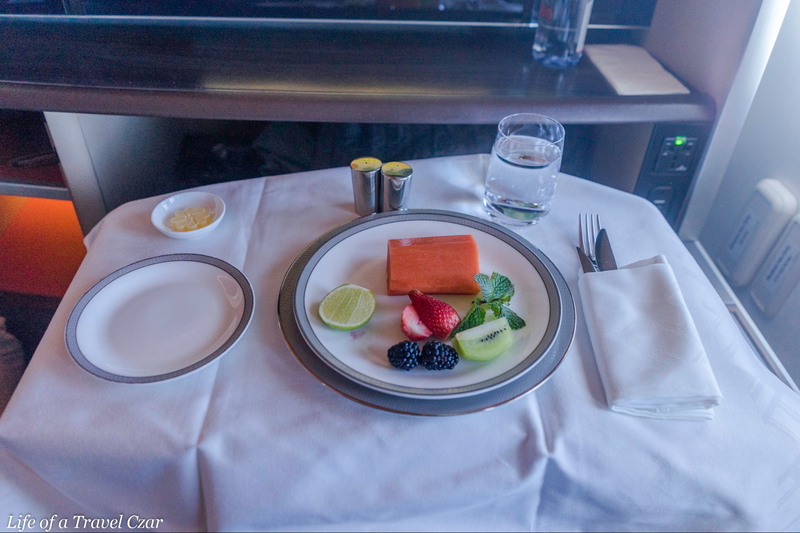 One of the best moments of the flight was actually having lunch in bed. The cabin crew obliged leaving the bed in place and setting the table for lunch. It is a lazy luxury moment in the sky. Here’s a little video clip of the lunch in bed moment. The background tune is “Everybody Wants to Rule the World” by Tears for Fears. I do not own any rights to the song. 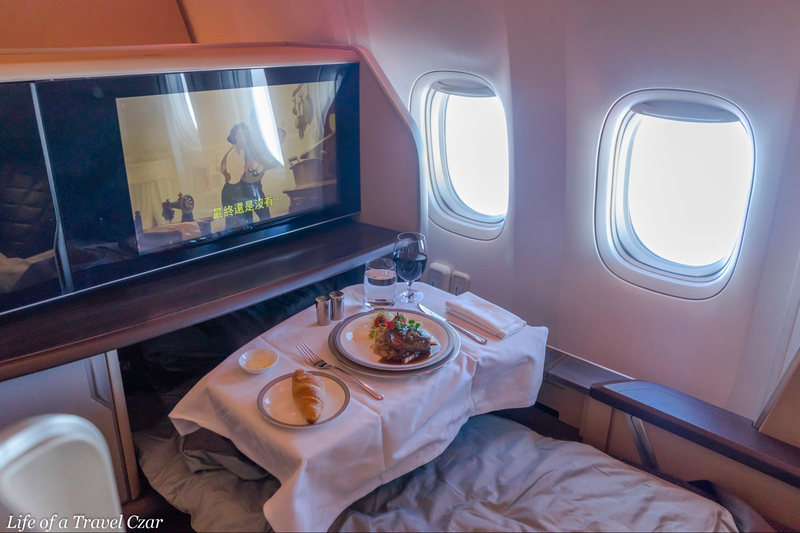 Overall I would reiterate my review from the first 777 flight which was from Sydney to Singapore (I recommend checking out that review as it’s a lot more comprehensive – you read it here). 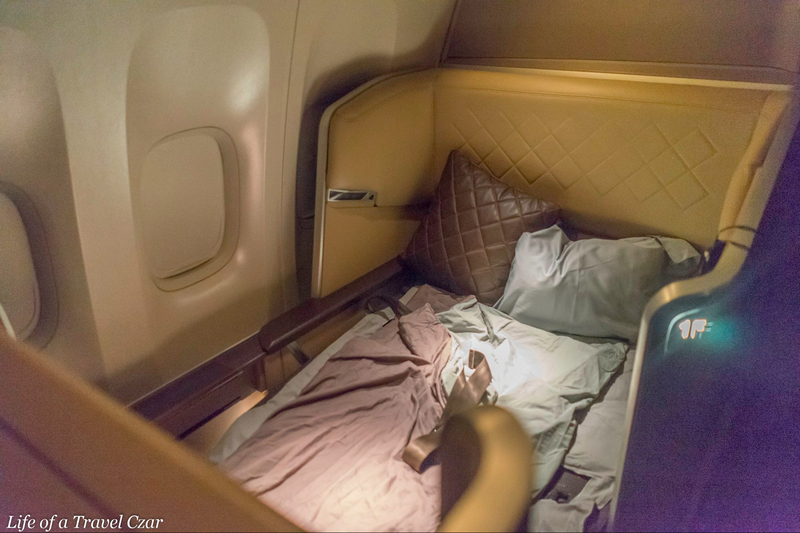 Singapore Airlines 777 of all the open suite first class products is comparable to what’s offered on Cathay, JAL, Qantas, Qatar and British Airways. 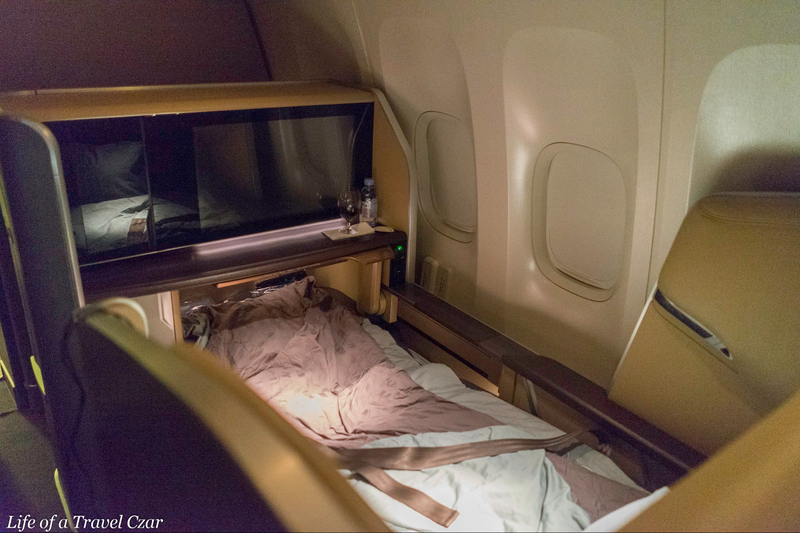 It’s obviously nowhere near Singapore’s new or legacy A380 Suites product. However, I would advise against overnight flights. I had no option but to take this flight as I needed to be back in Sydney, but overnight flights have fewer menu choices, limited service from the crew and an inability to enjoy the full benefits of the airlines. Plus it’s less instagrammable – but nonetheless a beautiful flight and a great way to end the holiday.